Step by step tutorial of creating beautiful charts (line, doughnut and bar) easily using Ionic 3 and Angular 4. Sometimes we need to create charts for displaying any progress or report in our Ionic 3 mobile apps. 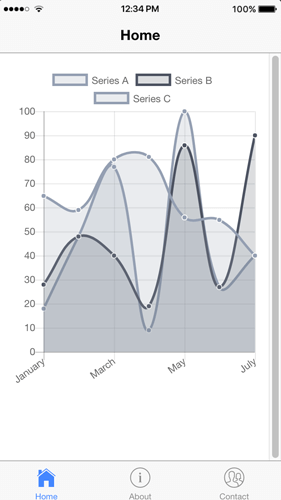 Right now, we have to show you a simple step by step tutorial on creating beautiful charts (line, doughnut, and bar) easily using Ionic 3 and Angular 4. This tutorial using existing Angular 2 directive module that can use very well with Angular 4. This directive makes the use of Charts.js more simple and easy to integrated with Angular 4 app, in this case for Ionic 3 mobile apps. We are creating Ionic 3 and Angular 4 mobile apps using tabs template. Open the terminal or Node command line then type this command. After waiting for NPM modules installed, go to the newly created app folder. To check the version of Ionic CLI and required tools type this command. 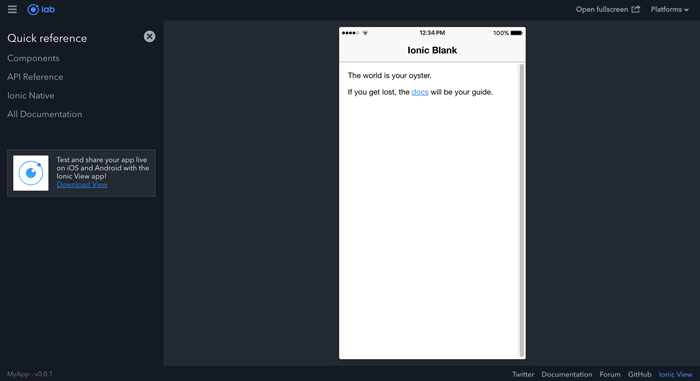 You will see the latest Ionic CLI versions similar with this (I'm using OS X). As usual, to make sure Ionic 3 app working, run this app first. It will automatically open a default browser with this page. To install Angular 2 charts and Charts.js, simply type this command. Open and edit 'src/app/app.module.ts' the add this import. 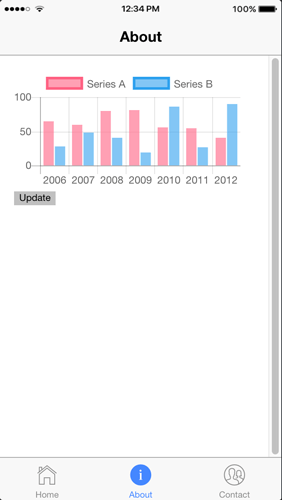 Then declare the charts module in imports array. That's the only things need to install. To show line charts add the default HTML tags that taken from Angular 2 charts example. Open and edit 'src/pages/home/home.html' then add this lines inside 'ion-content'. Now, open and edit 'src/pages/home/home.ts' then add this variables that required for build a line charts before the constructor. Now, run again the app. You should see the line charts inside the home tab. To create bar charts, we just use existing about tab. Open and edit 'src/pages/about/about.html' then replace content of 'ion-content' with this codes. Next, open and edit 'src/pages/about/about.ts' then add this variables before the constructor. Take a look again at the running app on the browser. On the about tab will look like this. 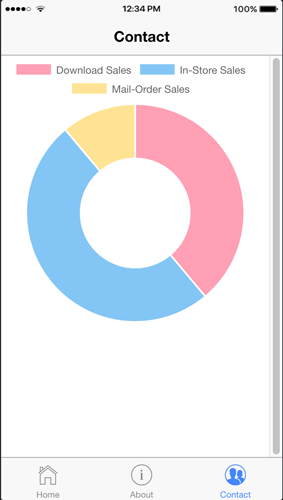 To create doughnut charts, we just use existing about tab. Open and edit 'src/pages/contact/contact.html' then replace content of 'ion-content' with this codes. Next, open and edit 'src/pages/contact/contact.ts' then add this variables before the constructor. Take a look again at the running app on the browser. On the contact, the tab will look like this. That's the sample of using charts in Ionic 3 and Angular 4 mobile app. You can find the sample codes on the GitHub.